Razer, the world leader in high performance gaming hardware, is taking your intense arena battling and frenzied hack and slash gaming to the next level with the Razer Naga Hex MOBA/action-RPG gaming mouse. Inspired by the award-winning Razer Naga MMO gaming mouse’s 12-button thumb grid, the Razer Naga Hex features six large thumb buttons optimized for the user interfaces found in action-RPG and MOBA games. Excitement in the world of gaming is heating up with the rise of the multiplayer online battle arena (MOBA) genre, with games like critically acclaimed League of Legends. Games that throw champions into a ring to arm themselves, level up, and duke it out against one another while defending massive super structures. Enter the Razer Naga Hex, designed with six mechanical buttons to specifically bind the spells, abilities, items, and other invaluable commands in MOBA games like League of Legends for faster and easier actuation. With a mechanical key infrastructure that requires less force to actuate, you gain the edge in speed over enemies, attacking before they can react. The Razer Naga Hex is also perfect for obsessive clicking in hack and slash games. Since both the RPG and MOBA game genres require intensive clicking, the Razer Naga Hex’s buttons are constructed with special switches for a performance of up to 250 clicks per minute – perfect for pro-gamers with lightning fast reflexes. Don’t worry about hyper-clicking though, as the Razer Naga Hex utilizes switches that are good for up to a whopping 10 million clicks. The Razer Naga Hex is designed with an ergonomic curvature that fits your hand comfortably. The placement of the six thumb buttons has also been perfected over countless design reiterations, and validated by MOBA pro-gamers to ensure you’re getting the best game control and grip. 3 interchangeable thumb rests of different heights are included so you get the best comfort and grip that suits you. This is especially important for reducing strain during lengthy gaming sessions at home or at highly competitive tournaments. The Razer Naga Hex will also be Razer Synapse 2.0 enabled – this means the mouse is installed with the world’s first cloud-based storage software that automatically saves all user custom mouse settings and profiles to a cloud server. These settings can then be accessed from any computer, with any Razer Naga Hex, ensuring that the mouse is ready for use instantly, and setup just the way you like it. 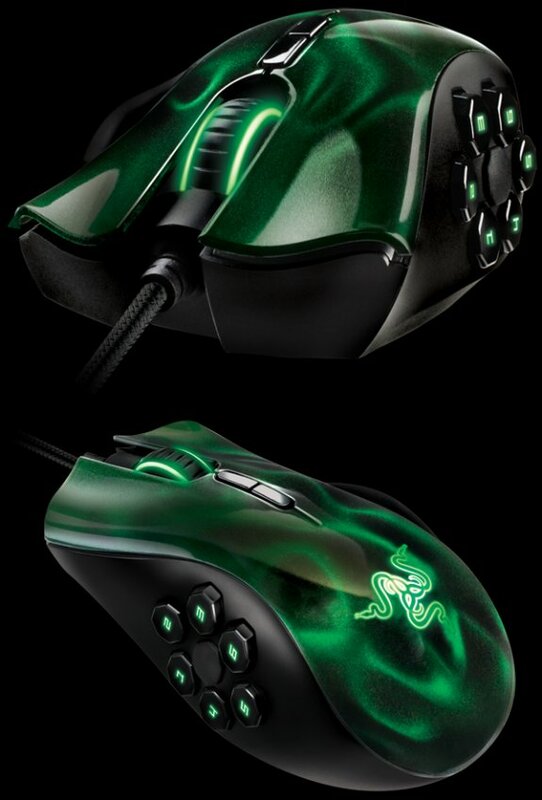 The Razer Naga Hex is perfectly suited for pro-gamers and fans of the MOBA/action-RPG game genres. It is primed with six mechanical thumb buttons for the exact number of controls necessary to suit the user interfaces of those games. Bind your skill-bar or inventory grid to the six buttons for faster, more comfortably efficient access to your full range of powers as you take the competition down.